Chu Ke Liang was a skillful strategist, a war expert, a philosopher, the emperor's adviser, a geologist and had mastered Sun Tzu art of war. In Feng Shui, masters devoted Chu Ke Liang's presence in our space as enabling us to think out-of-the-box, foresee the unforeseen, defeat our competitors, leap frog to the next level of excellence and heighten our wisdom. 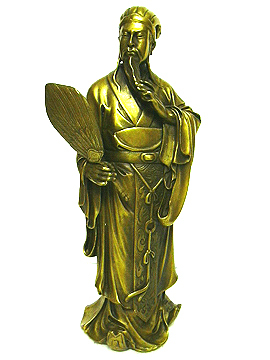 His statue is best to activate career/business/political luck at the Northwest and literary luck in the NE. His figure is also great for those in the field of writing such as authors, reporters and communications. This value-for-money vintage style artistic masterpiece made of bronze is definitely going to spice up your space. 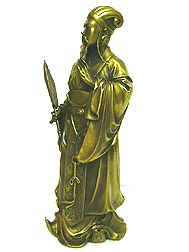 The masterpiece would also be a very suitable gift to managers, corporate leaders, close friends and relatives because it is made to impress and is meant to be collectibles to be displayed as your antique-collection in future. For those who have displayed the Kwan Kung with 5 Flags, they are also advised to display the bronze Chu Ke Liang together because one will not win their war without strategies from Chu Ke Liang! 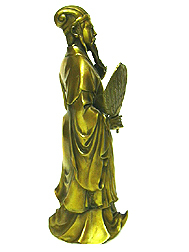 What Chu Ke Liang symbolizes? Chu Ke Liang was the cleverest man ever existed in China and was known to be the diligent strategist and advisor in a famous war among three kingdoms in China, where God of War Kwan Kung won his reputation. The story began in 169 and ended in 280, telling the battles and complicated connections among the Three Kingdoms: Wei, Shu and Wu.Ts'ao Ts'ao stood for the north power. He founded the Wei Kingdom. Meanwhile, in the south, Liu Pei, who once sold fans and shoes, founded the Shu Kingdom because of his Imperial Uncle title and reputation. And Sun Ch'uan, head of Wu Kingdom had his place in the southeast.There were many politicians and knights helping the three kings, and the most famous ones are Chu Ke Liang and Kwan Kung. In an attempt to consolidate China, Ts'ao Ts'ao made several battles with Liu Pei and Sun Ch'uan. Through many battles, such as the famous Battle of Red Cliff, Ts'ao Ts'ao was defeated even though he had a strong army due to Chu Ke Liang's ability to exercise his knowledge on wind, water and fire despite having a small army. 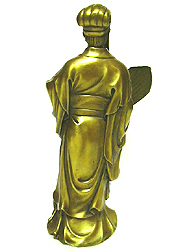 Chu Ke Liang is usually depicted carrying his unique feathered fan. His presence always depict victory in all competitions because he was able to think out-of-the-box and foresee the unforeseen. He is able to foresee his opponents' weaknesses, calculate the chances of winning and make wise decisions at bad times to capitalize on ultimate victory and gain. His presence is therefore important for speculative investors, businessmen, sales executives, people in the field of education, engineers, leaders and managers who are seeking victory, and also to be protected from being toppled in future. 1. In your study rooms, work rooms, offices and decision making areas. 2. Important areas of your living rooms and family rooms (especially in the NW for those who are seeking wisdom and NE for those who are seeking literary luck) to tap excellent Feng Shui luck and energies.